A Guide to Responding to Hate Groups: Lessons from Olympia, Washington by Reiko Callner and Anna Schlecht, coordinators of Olympia, Washington’s Unity in the Community, published on the Not In Our Town (NOIT) website. The organizations linked below provide valuable information regarding advocacy, education, community organizing, human rights and hate group monitoring, litigation and legislation. 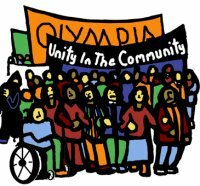 Olympia Unity in the Community does not necessarily endorse their every position. Based on the human rights enshrined in the Universal Declaration of Human Rights and other standards, AI undertakes research and action focused on preventing and ending grave abuses of the rights to physical and mental integrity, freedom of conscience and expression, and freedom from discrimination. Current AIUSA campaigns focus on Lesbian, Gay, Bisexual and Transgender Human Rights ~ Refugees & Immigrants ~ and Women's Human Rights. "The immediate object of the League is to stop . . . the defamation of the Jewish people. Its ultimate purpose is to secure justice and fair treatment to all citizens alike and to put an end forever to unjust and unfair discrimination . . . "
BDI counters organized racism, anti-immigrant activity, and other forms of bigotry through strategic research, community organizing, education and training around the globe. The Building Democracy Initiative believes that nativism and xenophobia must be challenged head-on for immigrant integration to be successful. At the request of Northwest activists, BDI has made available publications of the Northwest Coalition for Human Dignity (NWCHD), the Coalition for Human Dignity (CHD), and the Northwest Coalition Against Malicious Harassment (NWCAMH): Northwest Coalition for Human Dignity / Coalition for Human Dignity / Northwest Coalition Against Malicious Harassment Publications Archives including The Northwest Imperative: Documenting a Decade of Hate and the bi-weekly newsletter, The Northwest Update. A national organization committed to building community, justice, and equality. The Center is grounded in many faith traditions, and builds community where the dignity and value of all humanity is manifest. The CBC was founded in 1969. Then, there were 9 black members in the US House of Representatives: today there are 43. The CBC promotes public welfare through legislation designed to meet the needs of millions of neglected citizens. The core mission of the CBC is "to close (and, ultimately, to eliminate) disparities that exist between African-Americans and white Americans in every aspect of life." Hate Crimes: Current Laws and Policy Recommendations August 19, 2004 from The ACLU of Washington. Federal laws, federal reporting, FBI hate crime incident report, offense categories, federal hate crime incident report, bias motivation, state laws, state reporting, state training guidelines, policy Recommendations, resources and more. HRW is an independent US organization dedicated to protecting human rights through research, investigation, publicity and advocacy. See its United States pages on Gays and Lesbians, Immigrants & Non-Citizens, Racism & Discrimination, and Women's Rights. The mission of the Japanese American Citizens League (JACL) is to secure and maintain the human and civil rights of Americans of Japanese ancestry and others victimized by injustice. There is a Seattle chapter. The mission of the NAACP is to ensure the political, educational, social and economic equality of rights of all persons and to eliminate racial hatred and racial discrimination. Its vision is to ensure a society in which all individuals have equal rights and there is no racial hatred or racial discrimination. NCLR is the largest national Hispanic civil rights and advocacy organization in the United States. It works to improve opportunities for Hispanic Americans through research, policy analysis, and advocacy. NOT IN OUR TOWN is a national movement that encourages community response to hate crimes. The project combines PBS broadcast, grassroots events, educational outreach and online activities to help communities battling hate talk to—and learn from—each other. "Points to Remember When Responding to Hate Groups," from Works in Progress, March 2006. Reprinted from "When Hate Groups Come to Town: A Handbook of Effective Community Responses," 1992, the Center for Democratic Renewal. PRA is "a progressive think tank devoted to supporting movements that are building a more just and inclusive democratic society . . . We expose movements, institutions, and ideologies that undermine human rights . . . by providing research-based information, analysis, and referrals . . . PRA is the premier national organization studying the full spectrum of the US Political Right - from ultraconservatives in the electoral arena to paramilitary organizations to supremacist groups." A UK magazine, "Against Racism and Fascism." Founded in 1971 as a civil rights law firm, the SPLC produces tolerance education programs (Tolerance.org), tracks hate groups (Intelligence Project), litigates against white supremacists (Legal Action), provides expert speakers, and conducts training for police, schools, and civil rights and community groups. The Center works with neighborhoods, cities, states, and schools to help communities bring people together in dialogue across divides of race, income, age, and political viewpoints. See study circles on racism, immigration and diversity. Tolerance.org, a project of the Southern Poverty Law Center, seeks to dismantle bigotry and create communities that value diversity. It offers resources to support anti-bias activism and provides on-site help to concerned individuals and organizations who are working for unity in their communities. Teaching Tolerance provides educators with free educational materials that promote respect for differences and appreciation of diversity in the classroom and beyond. Turn It Down is youth, bands, parents, teachers, and friends in the record industry speaking out, standing up, and turning down the sounds of hate. See Soundtracks to the White Revolution: White Supremacist Assaults on Youth Music Subcultures (pdf file) and the companion Turn It Down Resource Kit (pdf file). "CRS is . . . dedicated to assist State and local units of government, private and public organizations, and community groups with preventing and resolving racial and ethnic tensions, incidents, and civil disorders, and in restoring racial stability and harmony. CRS facilitates . . . alternatives to coercion, violence, or litigation. It also assists communities in developing local mechanisms, conducting training, and other proactive measures to prevent or reduce racial/ethnic tension." See Publications. Washington State Hate Crime Trend 1995-2003 (pdf file) Pages 123-138 of Crime in Washington 2004 Annual Report by Washington Association of Sheriffs and Police Chiefs (WASPC). Primitive stats on hate crimes as reported by WA State law enforcement agencies. "Anti-female," gender-based crimes were reported as 0 in 2003.